MOSCOW, January 14. /TASS/. Russians shelled out an average of 13,870 rubles ($206) on the more than week-long New Year’s holidays, which is about 300 rubles ($4.50) less than last year, according to a survey by the Russian Public Opinion Research Center that TASS received on Monday. Last year, Russians spent an average of 14,195 rubles per capita ($211), the poll reported. "About 5,375 rubles ($80) went for gifts for loved ones and friends, and another 4,595 rubles ($68) for the New Year’s feast, and 3,903 rubles covered trips, Christmas trees, restaurants, and so on," it said. "Only 2% of those surveyed didn’t spend a dime on ringing in the New Year and holidays," the survey stated. New Year’s gifts exceeded many Russians’ expectations. Twenty-seven percent of them received perfume, cosmetics and fashion jewelry as New Year gifts, whereas another 17% got souvenirs. Meanwhile, 3% and 1% accordantly received theater or concert tickets and travel packages, well below their expectations, while one in ten (10% and 11% accordingly) was hoping to get them as a New Year gift. The holiday week was joyous for 69% of Russians polled against 73% who were happy about the previous winter holidays. The list of holiday activities was approximately the same as last year: 30% visited friends (42% last year), 28% (30% last year) strolled outdoors, and 24% went skiing or skating. The number of Russians vacationing at home grew significantly, from 18% last year to 29% this year. One in five Russians (21%) worked during the holidays. 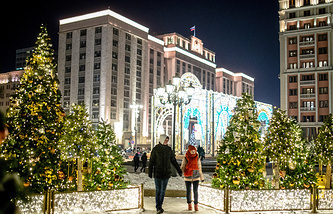 As many as 32% of Russian nationals associate an ideal winter holiday with skiing or skating, while 22% chose visits to historical places and sightseeing trips, and another 21% of the polled Russians say an ideal winter holiday is about the beach and the sun. Twenty-one percent said they would like to spend the holiday with their relatives. The nation’s leading polling agency conducted its survey on January 11, 2019 based on daily phone interviews with 1,600 respondents aged 18 and older. The margin of error does not exceed 2.5% at the 95% confidence level.